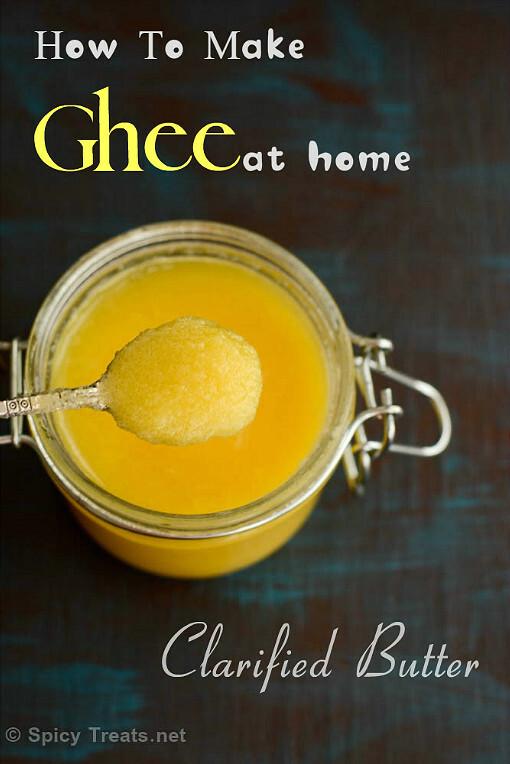 Homemade Ghee recipe with step by step recipe. 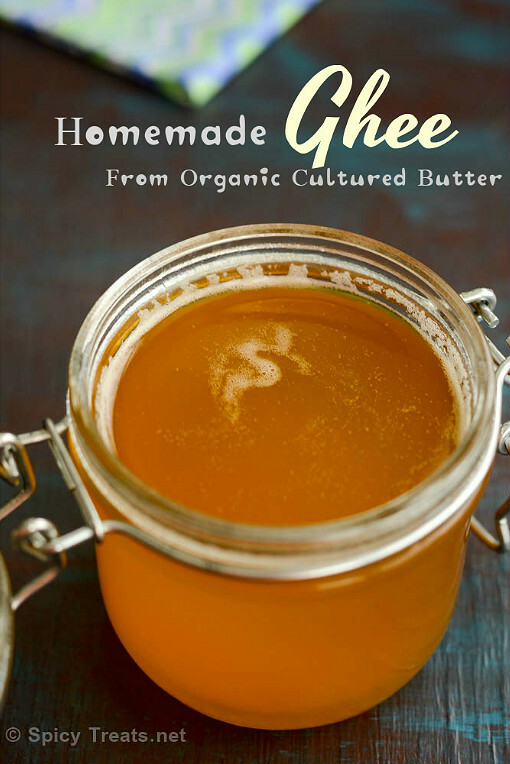 Making ghee at home is a very simple process and all you need is a good quality butter or homemade butter. Ghee or clarified butter Ghee is prepared by simmering butter, which is churned from cream or cultured cream and removing the liquid residue. The texture, color and taste of ghee depend on the quality of the butter, I prefer to use cultured butter than the regular sweet cream unsalted butter. Traditional way of making ghee at home is from cultured butter and the process includes 3 stages- Milk is boiled well and after cooling to warm temperature then yogurt/curd(culture) is added to make curd(8 hours). Then the curd is churned well to obtain cultured butter then that butter is melted/simmered to make ghee. Spices or herbs are added to make ghee more flavorful and healthy. I remember my mom and aunt churn a big pot of fresh homemade curd to obtain butter then that butter is used to make ghee. But in recent days, we do not have time and patience to make ghee the traditional way and rely on quick fix method by buying store bought unsalted butter for instant process. The store bought unsalted butter is not cultured and they are made using centrifugal force. It is then pasteurized by heating it rapidly to a high temperature to eliminate potential disease-causing bacteria and help the butter stay fresh longer. The cream butter is good for baking or sauteing or cooking or as a spread. But it is not suitable for making Pure Ghee with all its health and medicinal values. If you use cultured butter or yogurt made from fermented cream, you will receive all the probiotic goodness in the ghee. 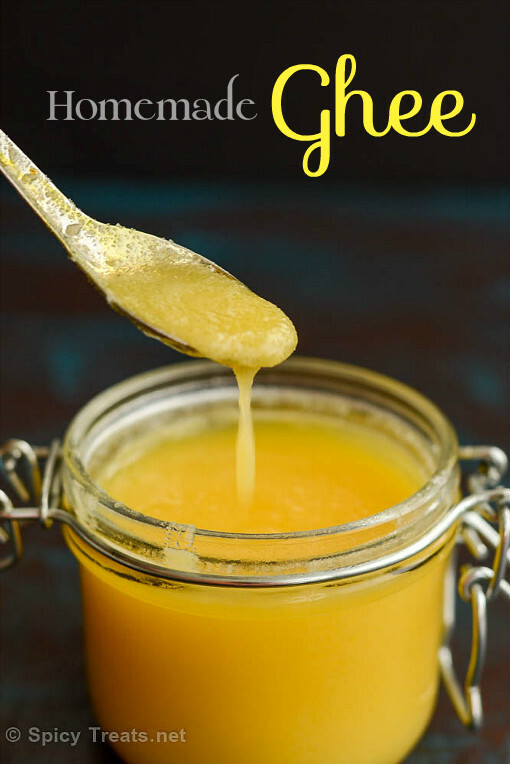 Ghee contains butyric acid, a fatty acid with antiviral and anti-cancer properties. 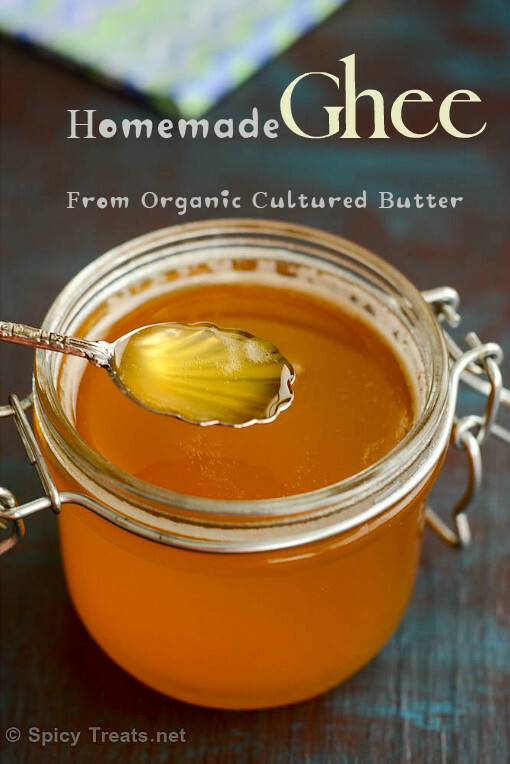 Ghee aids digestion and nutrient assimilation. So always try to use cultured butter to make ghee. Even i was using sweet cream unsalted butter to make ghee at home. Then after reading the health benefits of ghee in an Ayurvedic Cure Article, came to know that ghee from cultured butter is the real one and good for health. From that stopped using cream butter. The taste, color, texture and flavor of ghee from cultured butter is unbeatable. Aroma of Ghee from cultured butter is good and soothing. But the process of making ghee is same with both cultured and uncultured butter. Here i used store bought Organic Cultured Unsalted butter to make ghee at home. I promise to share an easy method of homemade cultured butter and also a detailed traditional way of making ghee soon. Only me and kids like ghee and we use on selective meal only. So i used only 2 sticks of butter that is half of a pound to make ghee, so it took 10-15 minutes or less to make ghee. If you are making it in big batch then the cooking time may vary. Now off to the recipe..
First chop butter into small cubes, this step is optional but it helps to melt butter quickly. Always use a heavy bottomed stainless steel or aluminium pan or kadai. Add cut butter pieces to the pan and cook in low-medium heat. Please cook in low-medium heat, let the butter melt slowly and let it melt completely. Once the butter is melted completely, you will find the fat separating from milk solids. And you will hear bubbling sound due to the water content. At this stage it is better to keep in low heat to prevent burning. I usually cook the whole process in low heat. The bubble gradually gets smaller and now try to collect the foam on top using a flat spoon and discard. The ghee is ready when the bubbling and foaming ceases, the milk solids turn deep brown and fall to the bottom of the pan and the Ghee itself is golden in color. If desired at this stage, add few crystals of sea salt or curry leaves or drumstick leaves. Adding salt gives ghee good crystal texture and also a natural preservative. 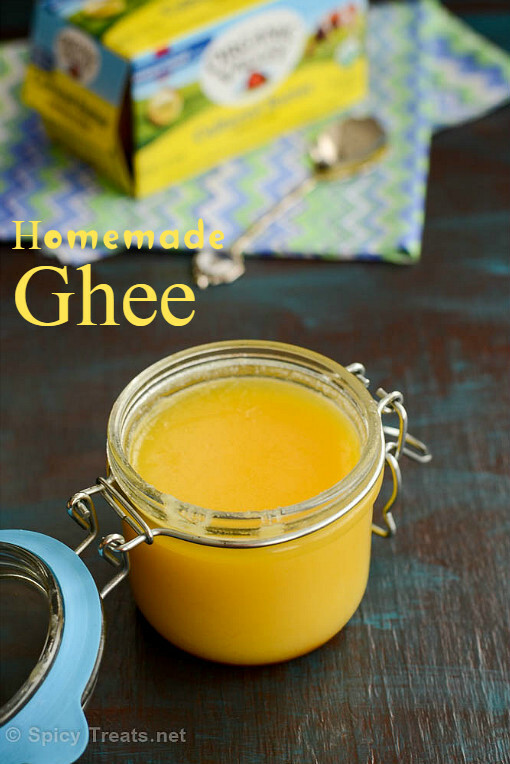 Now you will feel the aroma of fresh ghee, Remove from heat and let it cool for a while. Then Filter this into a clean container. You can Use layered cheese cloth, muslin cloth or fine tea filter to get the clear liquid. Do not close the lid of the container until ghee is cooled completely. I usually discard the browned mild solids. It is good to use cultured butter but alternatively you can also use any good quality unsalted butter. Spices like few cumin seeds, pepper corns, methi seeds can be added to ghee in the last stage. This ghee is good and flavorful to use in any savory dishes but cannot be used in sweet recipes. Adding drumstick leaves or curry leaves also gives nice aroma and texture to the ghee. Add few fresh leaves, if desired. Always cook the whole process in low-medium heat, after the sizzling sound stops keep on eye it will turn to next stage immediately. The color, texture and taste of the ghee depends on the quality of butter. If you are using homemade butter from the malai collected from boiled milk, after collecting a good amount of malai add 1-2 tbsp of curd to it and allow to ferment overnight. Then the next day make butter from the fermented malai(Cream). Ghee is always tasty when made with organic butter... nice instructions with pictures that are too good!